I love maps. Maps help us find where we are right now, but they also help us dream of places we would like to go, and learn about places far away that we may never visit in person. We have lots of maps here at APH, because geography is one of those core curriculum subjects that is not very accessible until you make a few adaptations. 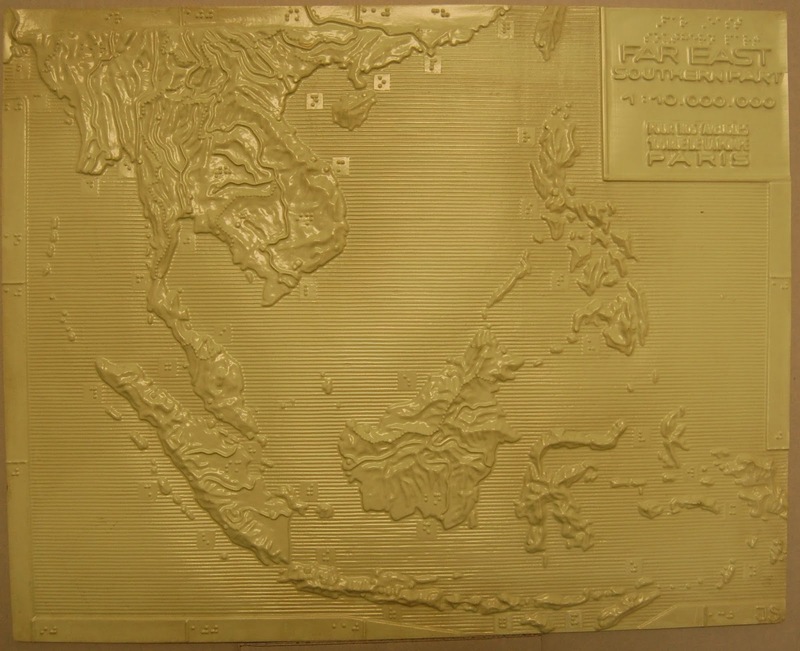 Our object this week is a thermoformed relief map of Southeast Asia including the historical parts of Indochina—think Vietnam and Thailand--and island nations like Indonesia and the Philippines. If you are not familiar with thermoforming, it basically involves heating sheet plastic in a way that forces it to form over a mold. This one comes from a set made by the American Foundation for Oversea Blind (AFOB), around 1950, in Paris, France. The water is indicated by horizontal ridges, and the relief helps you understand how mountainous the peninsula and many of the larger islands are. 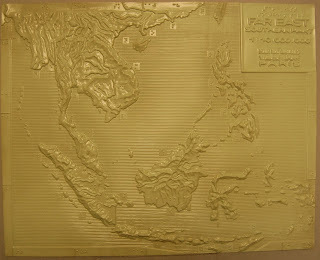 The map is geopolitical, meaning it has national borders in raised lines, and the nations are keyed in braille, although the key to the captions is not embossed on the map itself. The plastic is the same institutional green as my elementary school, although I don’t think that comes through in this photograph. Back in the day, it was considered a calming and soothing color. Perfect for studying geography!